The chief White House strategist is increasingly isolated in the West Wing as new chief of staff John Kelly tries to clamp down on negative news stories. President Donald Trump’s chief strategist Steve Bannon has been suspected in the past of orchestrating stories against his colleagues in Breitbart. The conservative news site Breitbart has waged a nonstop campaign against national security adviser H.R. McMaster, but so far it seems to have done the most damage to someone else: Steve Bannon. 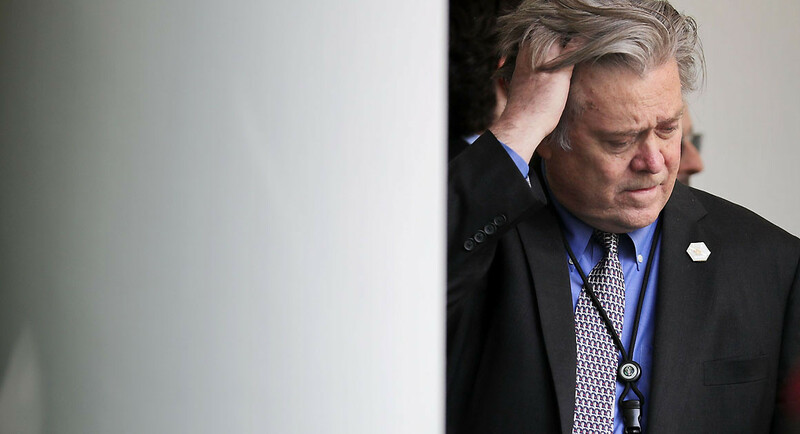 A Wall Street Journal editorial earlier this week accused Bannon of using the right-wing media to go after his ideological foes, questioning his loyalty to the president and placing blame for White House dysfunction squarely on his shoulders. The attacks on McMaster have put Bannon in an especially awkward position with his new boss, retired Marine Gen. John Kelly, who has been increasingly defensive of McMaster, a longtime friend and fellow general, according to interviews with 10 administration officials and people close to the White House. McMaster, who pushed Bannon off the National Security Council principals’ committee, hasn’t spoken to Bannon in weeks, one senior administration official said. Trump’s chief strategist has been suspected in the past of orchestrating stories against his colleagues in Breitbart, which he ran before joining Trump’s campaign last August. Kelly has told West Wing staff that he won’t tolerate the infighting or anonymous comments to the press that characterized the tenure of Kelly’s predecessor Reince Priebus. The continuing flood of negative stories targeting McMaster has served as a constant reminder that the problem was bigger than Priebus, who resigned two weeks ago. Bannon has grown more isolated without his ally Priebus in the West Wing. He remained in Washington this week while the president and other top staff have decamped to the Trump National Golf Club in Bedminster, New Jersey, and spends his days either holed up in his office or attending meetings. He avoids openly scuffling with his colleagues, as he often did in the past, and has moved to align himself with Kelly, telling allies inside and outside the White House that the arrival of the former secretary of Homeland Security was a win for Trump’s nationalist supporters. A White House spokeswoman did not respond to a request for comment. Bannon declined to comment. When he joined the administration, Bannon filed an ethics waiver so that he could continue to communicate with Breitbart. But it’s not just Breitbart stories that Bannon gets blamed for. When gotnews.com and blogger Mike Cernovich called deputy national security adviser Dina Powell and National Economic Council Director Gary Cohn “globalists,” all eyes were on Bannon, who privately coined the term. “Bannon is being portrayed as the puppeteer behind right-wing media picking and choosing between who they like and don’t like,” said the White House official. In the first two months of the administration, Bannon’s early disagreements with Priebus were a regular Breitbart storyline, often painting both men in a negative light. In February, Bannon publicly called a Breitbart piece attacking Priebus “totally absurd,” telling the Daily Beast in February that he was furious with Washington political editor Matt Boyle over it. But anti-Priebus stories remained a regular feature on Breitbart until his dismissal last month. Breitbart defenders said these stories are a sign of their independence from Bannon. The same dynamic played out with Breitbart’s coverage of Trump’s son-in-law and adviser Jared Kushner, which remained negative even after Kushner and Bannon came to a truce at Mar-a-Lago in April. The site has routinely published updates on Kushner's role in the Russia probe and been critical of his efforts to craft foreign policy or drive government innovation. “Do you think Steve wanted Breitbart putting bad stuff out there about Jared? No, because he knows he’s going to have to pay for it,” said a White House staffer. A Breitbart spokesperson did not respond to a request for comment. In June, Trump started telling aides that he suspected Bannon was a source of negative stories, according to aides. After a slew of stories about Bannon “winning” policy wars in the White House—like Trump’s decision to pull out of the Paris climate accord—the president told Bannon to “knock it off,” according to the senior administration official.